Marshall linebacker Chase Hancock (37) takes down a UTSA ball carrier during a Nov. 17 football contest at Joan C. Edwards Stadium in Huntington, W.Va.
BLACKSBURG, Va. — Contrary to popular belief, turkeys are quite capable of taking to the air. Virginia Tech had four touchdowns passes en route to a 25-point halftime cushion, then simply cruised into its 26th consecutive bowl appearance following a 41-20 non-conference victory over visiting Marshall on Saturday afternoon at Lane Stadium in the Old Dominion State. The Thundering Herd (8-4) committed turnovers on their opening two possessions, which in turn allowed the host Hokies (6-6) to take a quick 10-0 edge less than 10 minutes into regulation. MU running back Brenden Knox followed with a 2-yard touchdown run that capped 4-play, 72-yard drive with no time left on the first quarter clock, trimming the deficit down to four points. The Green and White, however, were never closer and went scoreless over the next 30 minutes of play, and Ryan Willis completed three touchdown passes during a 21-point second quarter surge that gave VT a commanding 31-6 advantage at the break. The Maroon and Orange tacked on a Brian Johnson 32-yard field goal with 2:41 left in the third stanza, giving the Hokies the first of two 28-point advantages in the contest. Marshall ended its half-game offensive drought on a 34-yard touchdown pass from Isaiah Green to Xavier Gaines six seconds into the fourth quarter, capping a 6-play, 75-yard drive that made it 34-13. Jalen Holston answered by breaking a few tackles en route to a 40-yard scamper at the 4:56 mark, ending a 9-play, 84-yard drive that resulted in a 41-13 cushion. Knox — who ended the day with 27 carries for 204 rushing yards and two touchdowns — ended the scoring with a 5-yard run with 1:43 left in regulation. The day was practically over for the Herd before it even began, starting with the opening play of the game. After a touchback put the ball at the 25, Green was strip-sacked by Ricky Walker. TyJuan Garbutt recovered the fumble at the MU 17 just six seconds into regulation. The Herd defense responded by surrendering only two yards, which eventually led to a Johnson 32-yard field goal for a 3-0 edge with 13:49 left in the opener. Marshall answered with a 12-play, 66-yard drive that pushed the ball deep inside the Virginia Tech red zone. Facing a third-and-seven at the nine, Green had a pass picked off by Bryce Watts in the end zone — allowing the hosts to take over possession at their own 20 with 8:49 remaining. The Hokies followed with an 8-play, 80-yard drive that ended with the first of four TD passes from Willis — this one to Hezekiah Grimsley for 46 yards for a 10-0 lead with 2:27 left in the first stanza. Tre Turner hauled in a 45-yard TD pass from Willis 15 seconds into the second frame for a 17-6 edge, then Steven Peoples caught a 7-yard pass with 4:10 left for a 24-6 contest. Eric Kumah also brought in a 32-yard catch for a score at the 1:12 mark for a 31-6 halftime lead. Virginia Tech held a 306-235 advantage in total yards at the break, despite having possession for only 12:19 of the 30-minute span. VT had 254 passing yards on a 12-of-16 performance from Willis, while Marshall gained 167 of its yards on the ground. Overall, the Hokies finished the day plus-2 in turnover differential after putting together an error-free outing. The hosts claimed a small 21-19 edge in first downs and ended the game with a slim 454-452 lead in total yards of offense. Both teams punted the ball five times apiece and Virginia Tech won the time of possession by a mere 28 seconds. The Herd was flagged 11 times for 67 yards, while the Hokies were penalized four times for 41 yards. Knox — who had 15 carries for 158 yards in the first half — accounted for all but 28 of Marshall’s 232 rushing yards. Green completed 19-of-34 passes for 220 yards, tossing one TD and one interception. Armani Levias paced the MU receivers with five catches for 69 yards. Obi Obialo was next with four grabs for 37 yards. Chase Hancock paced the guests with 11 tackles, followed by Omari Cobb with 10 stops. Malik Gant and Channing Hames each recorded six tackles, with Hames also amassing two of Marshall’s three sacks. Ty Tyler also recorded a sack for the Herd, who ended the day with six tackles for loss. Peoples led VT with 78 rushing yards on 14 carries, followed by Holston with 54 yards on four totes. Willis completed 18-of-26 passes for 312 yards, including four scores and zero picks. Dalton Keene caught five passes for 20 yards, while Kumah added 63 yards on four receptions. Rayshard Ashby made 15 tackles to pace the VT defense, followed by Dax Hollifield with nine stops/ The Hokies recorded only one sack and three tackles for loss. Reggie Floyd recovered the fumble that led to Virginia Tech’s first takeaway. 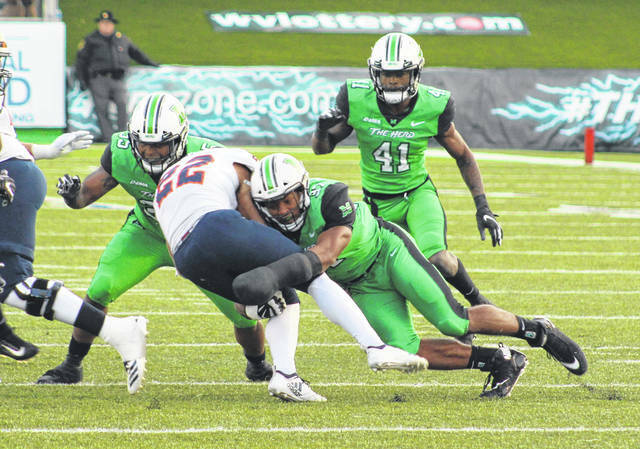 Marshall will be making its sixth appearance in a bowl game under ninth-year MU coach Doc Holliday, who is unbeaten in those five previous bowl outings. The Herd, however, won’t know where they are headed until sometime over the weekend.